This is a rare 3 Bedroom, 3 Bath with a pool, fenced backyard, fully equipped kitchen, and a beautiful view of the lake and mountains! It also has a circular driveway makes it very easy to load and unload from your busy days on our beautiful lake! 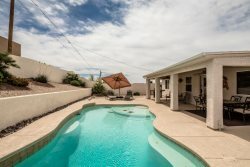 This property is located minutes off Highway 95 in the Northside of beautiful Lake Havasu City; close to shopping, restaurants, beaches and launch ramps! Very clean house close to the lake , I would definitely go back . great family vacation home . procedure was simple and easy. rooms were all nice, beds were comfy, living room set up was great.